This is the cure for the Monday Blahs! Let me introduce to you my Peanut Butter and Jelly Smoothie!! This smoothie has protein, energy, vitamins and nutrients, not to mentions tastes AMAZING!!!!!!!!!!!!! If you’re a fan of the famous peanut butter and jelly sandwich, then this is the smoothie for you. It’s made with non-fat milk, 2 tablespoons of the best healthy fat ever, peanut butter, greek yogurt and my personal favorite berry, strawberries!!! This is one of my best smoothies I have ever made in my opinion, however I am kind of bias since it contains peanut butter! My lovely step-daughter who eats the worse food ever, I’m not kidding about that, was getting ready for work, and I know her, she probably didn’t eat and would end up eating pizza at work. So I made this smoothie, poured it in her travel cup and said drink this at work. She said fine and out the door she went. The next morning she asked, was that a peanut butter and jelly smoothie? It tasted just like the sandwich and it was really creamy smooth. Yupper Doodles it was!! She said she loved it and loved how sweet it was. Ha ha no sugar in this drink. 🙂 I thought this smoothie is way healthier than the pizza and the candy she would end up eating at work. Plus this smoothie will fill her for hours and the protein boost will give her much-needed energy at work. I’m glad I could giver her something nutritious, since she needs all the nutrition she can get. I couldn’t even tell you what the last vegetable or fruit she ate and french fries and strawberries and cream frappuccinos from Starbucks don’t count! 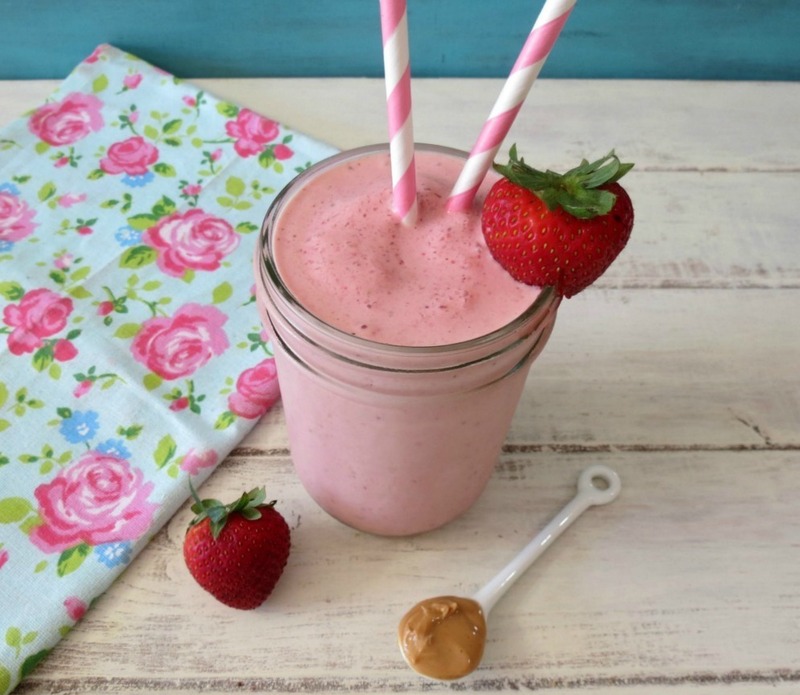 A thick, creamy, healthy smoothie that tastes just like a peanut butter and jelly sandwich. I hope you like my Monday pick me-up! I know how Monday’s are and it’s nice to come home from work and have a nice nutritious treat to ti me over till dinner. Since this recipe makes two servings, I can share the other half with Jenny. It’s nice to sit down together, sipping over a smoothie and talking gossip! Omg!! 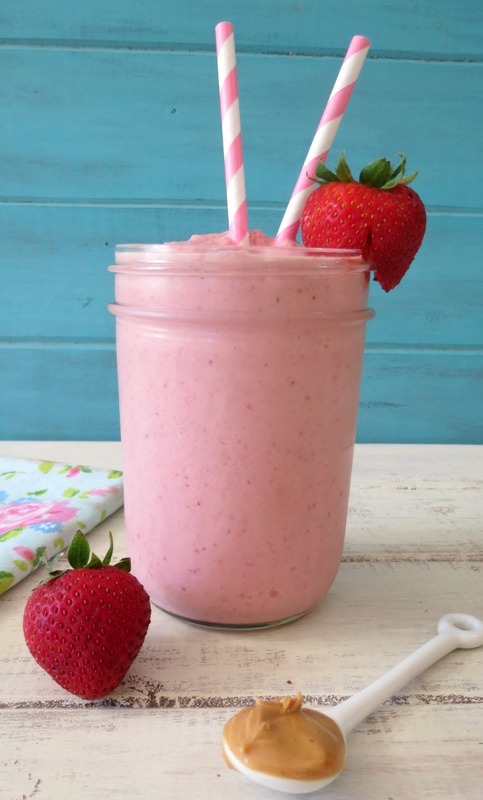 What a great smoothie recipe .Thanks for sharing. I also wanted to say I love love your blog your stories are great. Thanks again for all u do. What a fun, delightful way to start the day! BTW, you’re quite sneaky, fooling your step-daughter like that! lol, I have to sneak in nutrition some how with my crazy family!! Looks so yummy! I could live off of PB&J anything. However, I’m curious about the calories? What kind of PB did you use? Unless it was pb2, I don’t see how this is only 201 calories. 2 tbs of PB are usually 180-200 calories alone. Another lower calorie way to go is PB2, which has only 45 calories per 2 tbsp. It is very nice in smoothies. I love PB2, I use it all of the time! The stuff is amazing! Last week, I got some slack using PB2 instead of PB so I thought in this recipe I would go with peanut butter, but PB2 will work to! Jen has delish smoothies i pin them all lol. i think she has a great blog and web site and im always printing her recipes. So thanks Jen for another great smoothie, can’t wait to try it. Oh i also use Smart Balance PB. Yummm this sounds amazing! Peanut Butter Jelly time! YUM! PB & J in a glass-yes please! lol, I agree! Give my PB and J anytime anyway! I’m glad you found me too! Great idea on adding protein powder, I love that!! This looks so creamy, flavorful and refreshing! Thanks for sharing! Mmmm yummm I am going to have this for breakfast tomorrow!! Hi Kristi! You’ll have to let me know what you think. I am TOTALLY going to try this!!!! It sounds and looks amazing! Pinning! Thanks for sharing this, love your blog! I put peanut butter in a smoothie for the first time the other day! I don’t know what I was waiting for – it was SO good. I’ll have to try your recipe next time! I love PB in smoothies, but I don’t do it nearly enough!! I don’t know why? Hi Holly! I don’t think grapes would work well, to watery. Maybe you could find an all natural grape jelly and add that in. I Just don’t know how much you would need. What can I use as a substitution for steevia…it makes my throat swell shut…alergic! Hi Elle, I tried to write you from my phone, but it didn’t go through. Just use granulated sugar in place of stevia!! It will taste find. Just start out with a teaspoon and work your way up from there! Do you have to use the stevia and what is it for??? Good morning Camryn! Stevia is a natural sugar substitute, you do not have to use it. You can sub regular sugar in this recipe. Hi Jennifer, how are you? Lately I’ve been experimenting with smoothies and loving it, and this recipe is one that definitely I’m going to try. I just love smoothies! They are so fun to make. The PB & J is one of my all time favorites! Enjoy and have fun experimenting with smoothies! I love this! I added spinach to mine to get those leafy greens in. 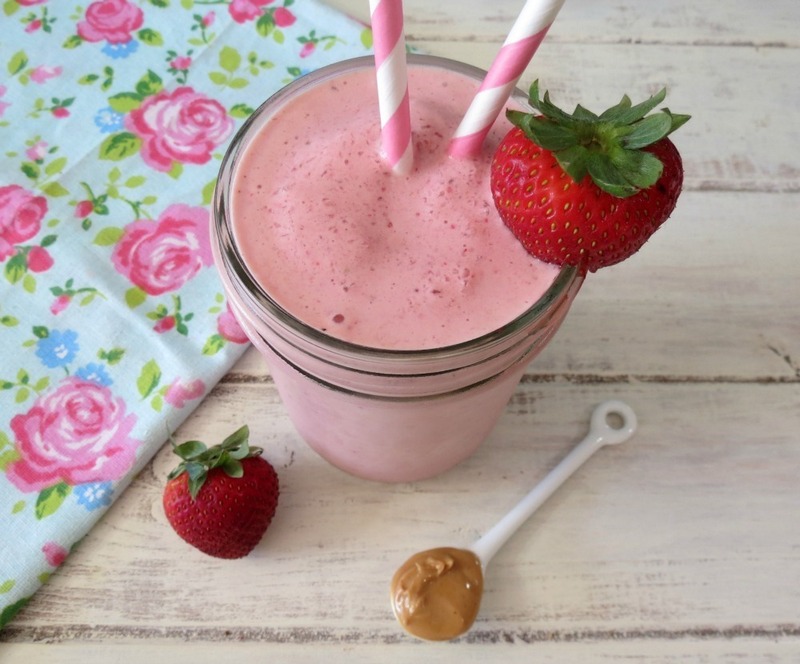 The flavors of the peanut butter and strawberries really shine through and this is delicious and filing. Thank you! I’m a big breakfast lover but lately I just haven’t had the time to make anything. From my morning walks to rushing to the college center to do my online classes, it just doesn’t work out. I just made this for tomorrow morning (I need brain power for my exams). Of course I had to taste test and oh my gosh, this is yummy! I couldn’t taste the peanut butter (I didn’t measure. Just added a big spoonful, so that could be why) so I added another 1/2 spoonful but other than that, it tasted just like the sandwich. Hi Hannah! I am so glad you like the smoothie. I made one for a friend this week and they said the same thing! It’s crazy, but so good! Good luck on your exams! Do you think nonfat vanilla Greek yogurt would work as well? YUM! This looks delicious! I love PB and J toast for breakfast but often don’t have the time in the morning to eat it. This is a great on the go breakfast!